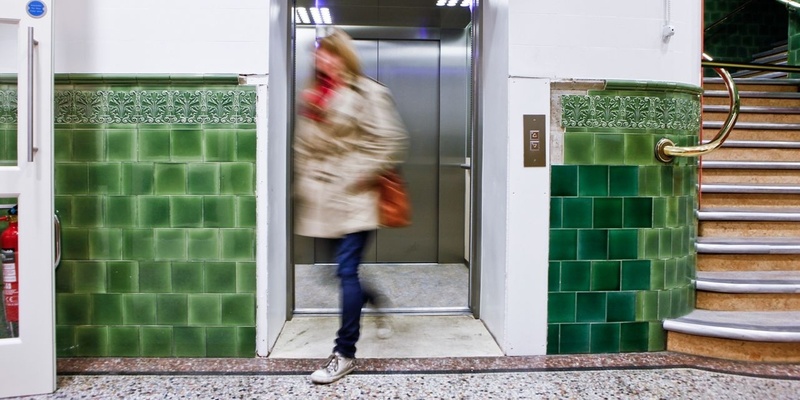 A helpful guide on the existing lifts in multi-storey housing developments and flats, from the different types of lifts, including fire-fighting lifts, to refurbishing existing lifts in tower blocks, we discuss it all in this insightful blog! Pre-war multi-storey housing developments were generally restricted to seven storeys before the days of elevators. Wealthy people lived on the ground floor and the poorest people lived on the top floor and so had to climb the most stairs. Social standing reversed with the advent of lifts, the penthouse being reserved for the wealthiest occupants. High-rise housing became the order of the day post-war and many of these developments still exist, refurbished, today. Lifts for apartments were key in the development of modern high-rise buildings as without them, moving to high floors by staircases would have been too arduous a task. As far back as the 1940s, the use of lifts with dedicated control features for firefighters was recognised in the UK and has been essential in high-rise buildings. We've had a British Standard for fire-fighting lifts since the 1980s. Today, there are estimated to be more than 50,000 operational lifts in UK housing, and it's likely that at least half of the lifts of these were installed more than 25 years ago (prior to the lift regulations that are in force today). As such, understanding the age of the lift and what regulations it adheres with, is key. Before modern lift regulations, lift design was a matter for architects, building design approval and customer requirement. Many high-rise tower blocks in the UK pre-date any nationally approved standard and may be laid out or function in unexpected ways. Therefore, it is the Lift Owner’s responsibility to ensure a lift service provider is appointed to manage the lift maintenance and to help highlight any new requirements of the latest standards. 1a. 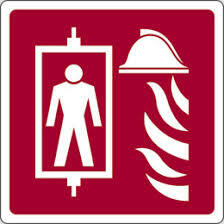 Is your lift a fire-fighting lift? As a default, all new passenger lifts are equipped to conform to British Standard EN81-73: Behaviour of lifts in the event of fire. This standard means the lift is connected to the fire-alarm system and in the event of a fire, will travel to the ground floor with its doors remaining open and no further calls taken. This enables all passengers of the lift to evacuate the building and fire-fighters to ensure there is no one trapped inside. This is different to a fire-fighting lift. Fire-fighting lifts are designed to have additional protection, with controls that enable it to be used under the direct control of the fire and rescue service in an effort to contain and eventually quell a fire. For housing, a fire-fighting lift is required if the building has a floor more than 18 metres above, or more than 10 metres below fire-service vehicle access level. For existing tower block lifts (where there is now a requirement for a fire-fighting provision), building designers can find guidance on modernising lifts intended for use by fire-fighters to improve their safety in BS 8899: Improvement of fire-fighting and evacuation provisions in existing lifts. 1b. Are you planning to use the lift as part of your building evacuation plans? In general, it isn't appropriate to use lifts when there is a fire in the building because there's always the danger of people being trapped in a lift that has become immobilised because of the fire, hence why the British Standard EN81-73 is in place. Again, signage around the lift will clearly indicate this. In some circumstances a fire-fighting lift may be provided as part of a management plan for evacuating people, in such cases, the lift installation may need to be appropriately located, protected and also contain a number of safety features that are intended to ensure that the lift remains usable for evacuation purposes during the fire. Studies have shown they can cut evacuation times by up to 40%. Guidance on the design and use of evacuation lifts is given in BS EN81-76: Evacuation of disabled persons using lifts. In addition, if a fire-fighting lift has been provided, this can be utilised as part of a management plan for evacuating disabled people. The proper maintenance, service and repair of existing lift stock plays an important role in enabling people flow in apartment blocks. Ideally, in any multi-storey housing, there should be two lifts serving all floors as a lift being out-of-action can cause disruption and upset to the residents. Therefore, in having two lifts, the disruption during servicing or awaiting the delivery of parts is minimised. Not to mention that all housing lifts are in constant use, so we'd always recommend regular and thorough lift inspections with 24hr service cover. 2a. Teaching an old dog new tricks! An elevator is an engineered product with a finite life-span, after which it can be refurbished in part, or removed and replaced with newer, more efficient equipment. The image above shows the before and after of one of the three lifts at Gunnersbury Court, where the replacement of the antiquated lift system with new lifts, was central to the project. 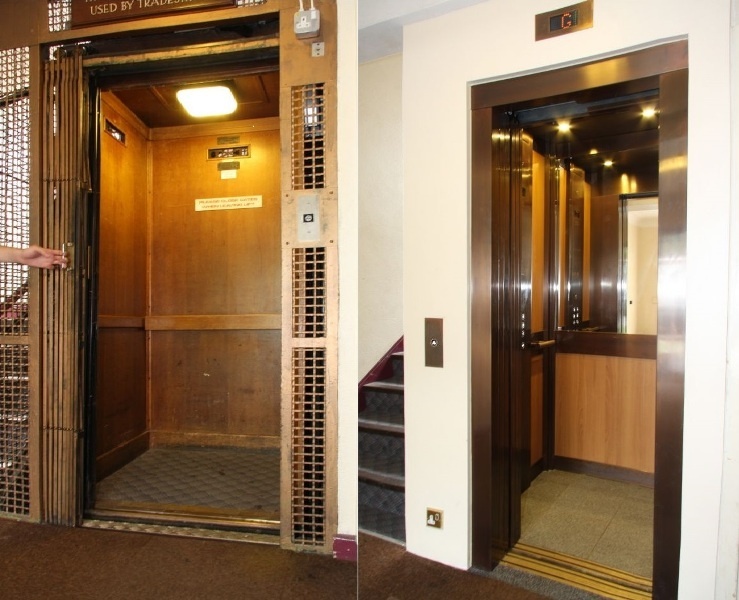 These lift refurbishments and replacements are completed within occupied buildings and as such, a lift company will work with property owners, tenants, builders and lift consultants to ensure the work is carried out safely, causing minimum disruption and always providing a means of access for all building users. Lift equipment has a life cycle that can be extended by refurbishment of parts and modernisation of aesthetics but eventually, the most economical solution will be complete removal and replacement. Safety for lift users and our lift engineers is always paramount to any decision made to replace existing lift equipment. The first step for a replacement lift is for a lift company to undertake a site survey, to establish whether a new lift can fit into the existing shaft and to give advice on the most suitable size and specification. Most lift providers are able to supply lift services to local authorities, councils and housing associations, to help maintain the existing stock of passenger and goods lifts in communal access areas, stair lifts and disabled lifts for tenants. We work in both private and public housing, forming strong relationships with leading contractors for design and build tenders, working with architects and clients in traditional procurement routes, and liaising directly with Housing Associations to provide lifts based on the needs of the tenants. Why not find out more about the work we do within the housing sector? Or alternatively, why not contact us to discuss your requirements – we know we can help. Have a question? No problem! Get in touch to speak to one of our lift experts. Stannah offer a wide range of lift solutions to move people and goods. With nearly 50,000 installations across the UK and over 90,000 units on our service portfolio, we know we can help.